Global Milk Fat Fractions Market size was worth over USD 8 billion in 2016 and will witness CAGR over 7% in terms of revenue up to 2024. 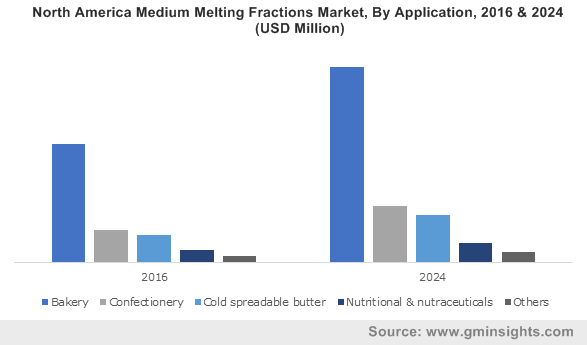 Strong outlook in bakery & confectionery, spreadable butters and nutraceutical applications due to substantial health benefits will propel the milk fat fractions market growth. Significant properties including melting temperatures specific to application are among key factors driving the industry demand. For instance, low melting products (LMF) are most suitable for cold spreadable butter due to effective melting at lower temperatures (less than 15 0C). Increasing consumer consciousness pertaining to health disparities associated with high intake of saturated lipids has resulted in considerable decline in the dairy products consumption. Natural production of healthy unsaturated lipids in fractionated milk fat provides a positive outlook for industry growth. In addition, adequate supply of omega 3 along with assistance in body weight reduction will support the product demand. Necessity for flaky and crusty butter particularly in bakery & confectionery applications has enhanced the product demand. Increasing bakery product consumption due to changing food habits and living standards will drive the industry growth. The U.S. is among the major bakery products market globally with retail sales valuing over USD 89 million in 2016. Asia Pacific bakery products industry was worth over USD 86 million in 2016. Increasing consumer spending on dietary supplements owing to rising awareness pertaining to health & safety will propel the industry demand. Rising demand for high melting products particularly in chocolates and ice creams due to its hard and improved cream whipping properties will drive industry growth. Additionally, excellent suitability of fractionated milk fat as compared to conventional dairy products in several food applications will open new avenues for product demand. Shifting focus among dairy companies to expand healthy product portfolio will provide positive outlook for fractionated milk fat market. Abundant raw material availability particularly in Asia Pacific and unified co-operative value chain of dairy industry will support the industry demand. As per FAO, global milk production reached 816 million tonnes in 2016 growing from 803 million tonnes in 2015. Furthermore, growth in retail distribution of dairy & bakery products along with high profit margins will fuel the industry growth. Increasing raw material costs including butterfat & AMF and expensive production costs are among key factors affecting fractionated milk fat price trend. However, lower product commercialization mainly in developing countries due to lack of awareness about product benefits may hamper the industry growth. MMF market is anticipated to worth over USD 5.5 billion by 2024. Strong outlook in pastries and croissants delivering a crusty & flaky texture has enhanced the fractionated milk fat demand. In addition, rising demand from shortbread, biscuits and cakes production will support the product penetration. These products are sequentially crystallized using several technologies along with high melting and low melting products. LMF will witness growth over 5.5% up to 2024. Increasing product usage in several applications including cold spreadable butter, dairy powder and confectionery products will propel the industry growth. Improved butter flavour along with easy spread-ability are among key properties supporting product demand. LMF products are also among crucial ingredients in formulations of HMF and MMF blends. Dry fractionation accounted for over 40% of the industry share in 2016. Simple production process, high efficiency and cost-effective properties are key factors driving the dry fractionation or melt crystallization technology. Improved filtration efficiency used to obtain butter plumpness and separation of the solid product from remaining melt provides a positive outlook for the product demand. Rising demand from chemical composition development and crystallization applications will support the industry growth. Supercritical fluid extraction is expected to witness CAGR exceeding 7.5% in terms of revenue up to 2024. Significant properties including continuous production process, non-toxic, efficient fractionation and flavour enhancement are major supporting factors of industry demand. However, lower adoption due to high capital investment and expensive processing cost may hamper the technology demand. Solid formulations of accounted for over 50% of the industry share in 2016. Rising demand from spreads and chocolates as a potential ingredient will propel the industry growth. Technological advancement in crystallization process have enhanced the efficient stearin formation, separated from liquid or olein portions. Liquid form of milk fat fractions market will witness CAGR over 5.5% up to 2024, owing to its high compatibility for cholesterol reduction from numerous production methods. Short-path distillation offers best means of reducing the cholesterol content of olein formations with least change in product composition. Increasing demand for butter processing and cream homogenization in a feasible liquidized form will positively influence fractionated milk fat market. Milk fat fractions market from bakery products is anticipated to register more than 700 kilotons by 2024. High compatibility butter replacer offering soft texture and consistent product quality with no seasonal variation will propel product penetration. Increasing consumer preference for bakery products including cakes, butter cookies, biscuits, pastries and brownie due to changing lifestyles will support the industry growth. Confectionery products will witness gains over 6% up to 2024. Favourable demographic trends including larger children population along with innovations in sugar confectioneries are among key factors driving the fractionated milk fat demand. Shifting consumer preference for flavoured products coupled with increasing chocolate usage in customized and personalized food products will support product penetration. North America milk fat fractions market was worth more than USD 2 billion in 2016. Presence of large number of food manufacturers along with ease in transportation and storage due to integrated logistic networks will propel the industry demand. Expansion in dairy industry along with abundant raw material availability has enhanced the product demand. 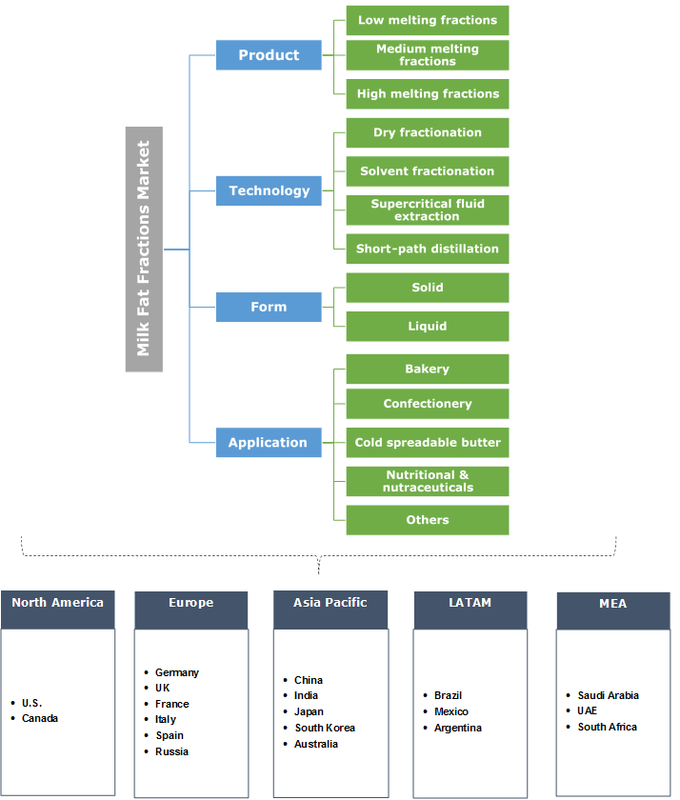 Asia Pacific milk fat fractions market depicted CAGR over 6% up to 2024. Growing population with lactose intolerance will fuel industry demand as fractionated milk fat provide better lactose-free options particularly for children and women. Moreover, increasing influence of western diet culture resulting in higher demand for pastries, cakes, and cookies will stimulate regional demand. Global milk fat fractions market share is competitive in nature. Uelzena Ingredients, Friesland Campina, Glanbia Ingredients, and Royal VIV Buisman are among major industry players. Other notable companies include Oleo, Wilmar International, MCT Dairies, Flechard S.A., FIT Company, and Fonterra Cooperative Group. Research & development investments and adoption of modern fractionation technologies are among major strategies adopted among the industry participants. Fractionated milk fat has witnessed increased usage in recent years owing to its nutritive advantages essential for human body growth & development. It is widely used in several bakery products owing to nutritional benefits such as vitamins A, E and K2 vitamins associated along with consumption of products. Federal Food & Drug Administration established standards in 1998, for dairy products including whole dairy products must have low fats 0.5-2.0%, no less than 3.25% and skim dairy products must have 0.5%.